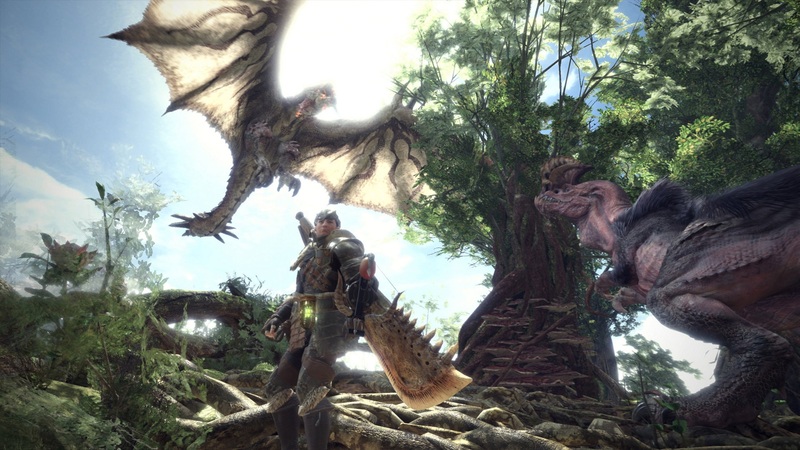 It has been a long time since Monster Hunter graced the west with a game on a console, but at last, Capcom have brought their largest offering yet to the party. During the past generation, Monster Hunter most notably lived on through the Nintendo 3DS, and while those titles were excellent in their own right, the series always seemed to feel like a larger experience packed into a small space. Monster Hunter World stretches its legs out with a new narrative, a more expansive terrain, and more monsters than ever before. How well is this beast managed in this habitat? Let’s find out. 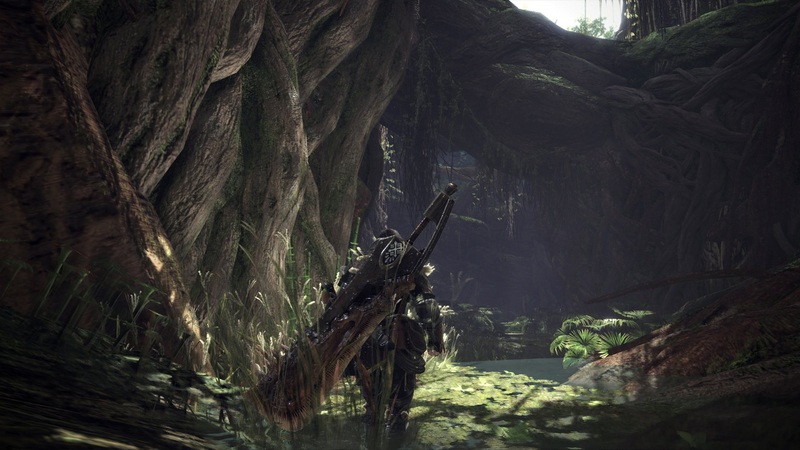 Monster Hunter World has a story, albeit a rather thin and vague one. 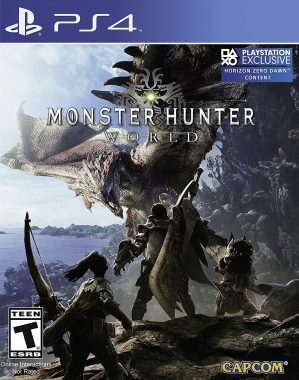 The player starts out working for the Fifth Fleet as a hunter, and along with a Palico sidekick and other personalities, is thrust into a story as a large monster attacks your vessel, bringing everyone to Astera – a small village bursting with life and other hunters who are all aligned with your very motives. It is a simple narrative that just acts as string to tie everything together. Like most titles in the franchise, this one only utilizes a story as a foundation, and has a ton of other elements and tales that blend it all together to make this world have a deeper purpose, filled with lore, charm, and depth. I have a friend who loves games like Dark Souls, Skyrim, Dragon’s Dogma, and so on. Every year or two for the past few years, he has continuously picked up the portable entries to Monster Hunter, and every year he couldn’t quite enjoy the games as the overall feel was simply not for him. Of course this comes down to taste and personal preference, but the point I am making is that if you are one of those people who have tried Monster Hunter in the past and simply did not like it, World is not out to change your opinion. While this title is certainly a bit more accessible that some, it still has a bit of an entry fee, or learning curve if you will. I could easily see some who thought difficulty blocked them in the past being more open to this adventure, because it is definitely more open to newcomers. That said, some tutorials, such as weapon and crafting tutorials are just as vague, and will require patience and time to master. 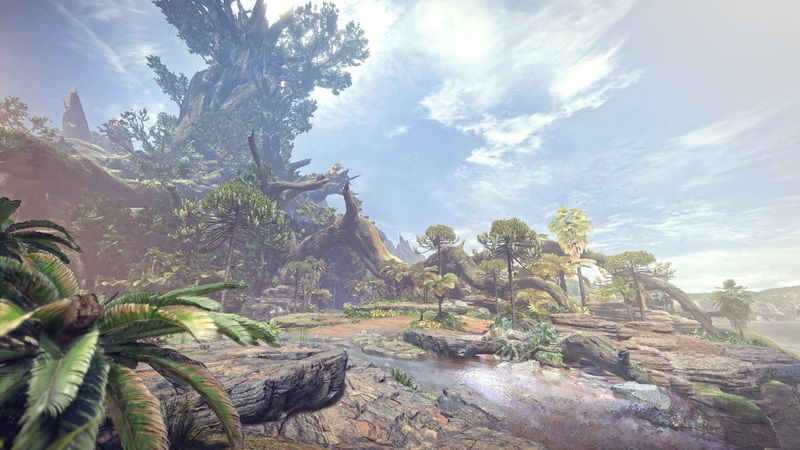 Monster Hunter World is a game that is able inhabit a great number of fresh experiences with the player as despite the core mechanics never changing, minor upgrades and nuances can make the overall product feel like a completely different experience each time you decide to partake in the journey a different way. As you know, this world is made up of quests. Some are story driven, while others may be tasks assigned by a quest board or simple townsfolk who are offering small rewards for completion. Each quest takes you to a different locale, with objectives that may consist of gathering ingredients or slaying the biggest beast in the land. There is always something to do as even if you have performed a quest, going back in to get more materials to craft armor or make potions that will be valuable for the next hunt is always an option, which will keep the general cycle continuing to constantly provide some type of entertainment. Combat is one of those moments of freshness that a player can bring to themselves by simply changing out their arsenal. With fourteen different weapons, each have their own unique pros and cons, and feel completely different while in battle. Sometimes changing a weapon can make all of the difference as well, so if you are not really into holding the heavy and slow sword, you can switch out for daggers, or even the returning insect glaive. As you play, more and more parts can be found to upgrade each weapon as well, as this may be the Monster Hunter title with the most customization to date. Armor, consumables, bombs, and so on can all be crafted, and all allow for some type of noticeable improvement for hunts. The depth for the game comes with deciding where to best utilize your rewards from each hunt, and building a character that eventually will be equipped for any situation at hand. One of the most welcome features is the drop-in multiplayer. Players can now go on hunts with several other hunters at once, and bring their entire party (up to four players in an online co-op setting) to assist. Eventually, you can even create a squad, which is about the same thing as an in-game clan of the past. From what I have played online thus far on the Playstation 4, the connections have been rather solid and it is definitely a lot more fun to go out in these landscapes with others, rather than heading out alone. The game is even ok with just two, as it will replace the two missing players with you own Palicos. The game even has an SOS function to summon other online players if you are in dire need. While this is not going to apply to everyone, it is still lovely to see Monster Hunter to constantly add to the online function as we see each title roll out for the franchise. Visually, Monster Hunter World is stunning. Featuring a wide assortment of color and life, every location is worthy of merit due to the high level of detail, and many of the monsters look better than ever before, featuring new minor additions as well as more fluent animations. The game does allow for players to choose a bit as well. Maybe you notice a drop in frame rate. Well, you can go in and choose your own graphical settings. While it doesn’t make up for a complete package console experience that would bring the ability to have everything run smoother, it is a nice option to those who do not have a pro or a console with a slightly more powerful core. The audio is wonderful as well. 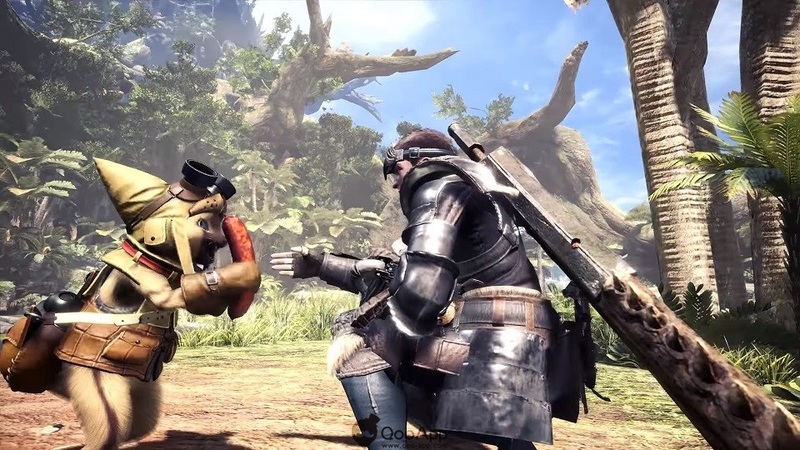 From the cries of a Palico to the cheeky effects that play while exploring, there was a ton of effort put into audio in Monster Hunter World. The soundtrack is also exceptional, bringing new tunes that truly keep this universe together with the rest of the series. The increase in tempo and slow progression for bigger buildup also makes exploration feel like an epic journey, with wide spaces put before the player only to have incredible music to make the already large world beam with an incredible atmosphere. In short terms, the OST is lovely, and is just as important as any other element in the game. Monster Hunter World is a massive undertaking that is sure to go down as the pinnacle for the franchise. 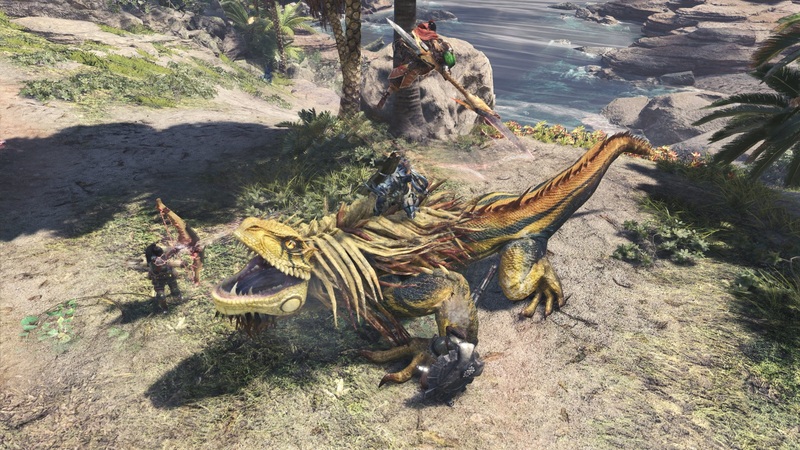 With a large world to explore, a never-ending amount of quests and tasks to accomplish, and the most customization to date, it is easy to see why Capcom have hyped this beast for so long. For every issue, there is a fix in some way or another, allowing players to shape their shortcomings by providing options. It is that kind of development that makes this title great, and makes this transition feel so accessible and seamless. Console owners, your hunt ends here.